The final week of 2016 has been difficult for Star Wars fans. Not only did Carrie Fisher pass away, but also her mother Debbie Reynolds — best known for her role as Kathy Selden in Singin’ in the Rain (1952) — the following day. Both left lasting legacies. Fisher will always be known as Princess Leia from Star Wars, and Reynolds is a legend in musical theatre. She was a tour de force. The news of their passing had Hollywood and myself reeling. The Star Wars world has seen at least two memorable performers pass — Michael Sheard (Admiral Ozzel) and Kenny Baker (R2D2). With Fisher, she will always be this Galaxy’s Princess. As an advocate of mental health and addiction issues, Carrie has always been very vocal to bring awareness to it. She has bipolar disorder, and that has never stopped her for being who she is. When I first heard of this, I thought I can relate. I admit to having my sour days too, and it never stopped me to be who I am. She was my role model; to see her indomitable attitude and scrappiness that helped lift my spirits. Without Gary, her registered therapy French bulldog to give her that loving support, she might have been in a different place. I became a fan when I saw her in The Blues Brothers. Here, she was a force of nature. There was a quiet ferocity as she was out to get Jake Blues. She hated the fact he ditched her at the wedding altar, as friends and families gathered. Though they sort of made peace, she was quick to cut loose again when he (physically) dropped her yet again. Vigils have been held nearly around the world in the past few days — one in Seattle and another at New Orleans, to honour Carrie. The fandom in Victoria, BC is working together to do something different and I visited Cherry Bomb Toys today to see how they are organizing it. This “event” will last for the entire month of January, and a corner of the store is being dedicated to sell products (toys, comics, Star Wars memorabilia, film strips or miscellany) donated by the fans — this store’s own stock included — in a fundraiser to bring money to the Victoria Hospitals Foundation. This operation helps people who are struggling as Fisher did. Cash is preferred over debit or credit card. That way, all the money goes to where it’s needed instead of covering the fees bank charge. B. Woodward, the owner of the shop, said it does not have to be directly related to what these performers are best recognized for either. 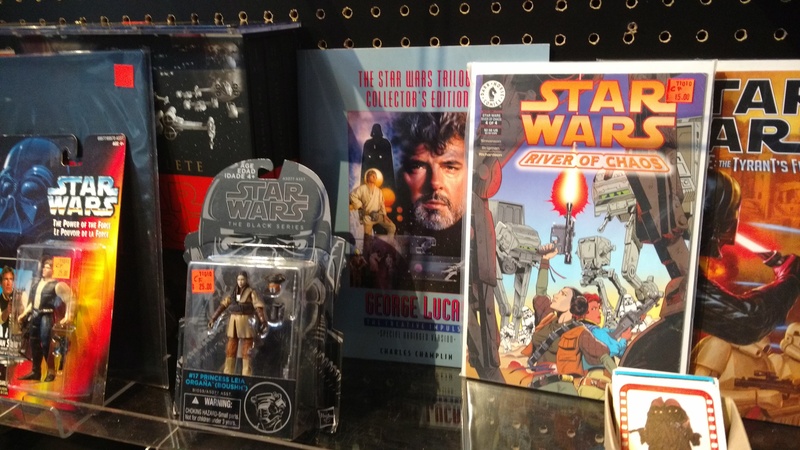 On another shelf, yes this store has Star Wars Dixie Cups! For support outside of the island and beyond, all you have to do is offer your time by volunteering at a mental health clinic. Donating money helps, but it does not always provide an immediate solution for those in dire need. It pays for the special programs these operations develop and for acquiring the equipment necessary for proper diagnosis and care. As I struggle with my own erratic seasonal depression, sometimes all I need is that emotional support. Having those close friends that you can speak to help. To know that we are not alone can defeat those demons attempting to tear us down.